This year marks the 120th anniversary of the Venice Biennale. The 56th edition of the exhibition, curated by Nigerian born Okwui Enwezor, has attracted much media attention in 2015 for the perceived political overtones in much of the work on display, evident particularly in the International Exhibition in the Giardini and Arsenale galleries. This has been augmented in no small part by what feels like a host of National Pavilions that also speak to a multitude of social, political and economic issues and pressures of the time. With that said, Enwezor himself has been weary in the past of such overarching narratives, particularly when they concern such a considerable swath of different cultural elements as the Venice Biennale inevitably does. Central to the event in 2015 is a broadly conceived notion of research, which serves as a useful starting point to approach the huge volume of work from 89 participating countries and spread across over 40 collateral events between May and November. In the press release the organisers state that at the base of the Biennale this year “is the notion of the exhibition as stage where historical and counter-historical projects will be explored.” Enwezor’s curation here in amongst the very international setting of the Biennale in some ways acts as a renegotiation of ideas of place and history, in the process creating new dialogues that subvert more traditional distinctions and boarders. Questions of nationality are at the heart of Serbia’s exhibition, United Dead Nations where Ivan Grubanov has created an installation featuring the flags of now non-existent national entities, the names and dates of which are written in white on the walls. The effect is poignant, giving the Pavilion space the aura of a tomb or mausoleum, which feels fitting given the fact that many of the national entities ceased to exist with the end of the Cold War and the collapse of Communist governments across Europe. The mausoleum was in some ways synonymous with these regimes who sought to mythologise their dead leaders as heroes of the proletarian revolution, and here Grubanov’s work speaks to the very idea of the Nation State at an event where pavilions featuring the names of sometimes non-existent countries are the major venues. Serbia’s pavilion for example still has ‘Yugoslavia’ carved in stone high above its front door. 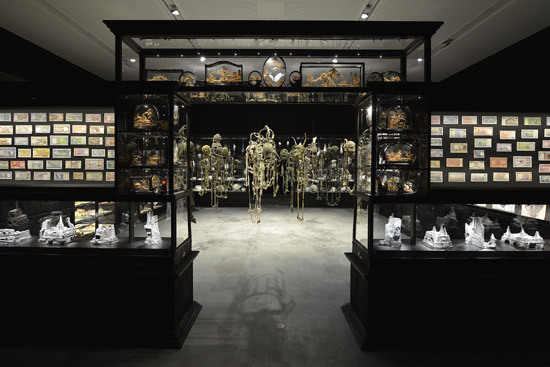 Fiona Hall’s magnificent exhibition in Australia’s Pavilion also creates a kind of archive of place, with a huge body of works that address the three interconnected realms of global politics, world finances and the environment. Entitled Wrong Way Time, the installation features an incredible wealth of small objects, works and ephemera, beautifully displayed in the new building built for Australia and on show for the first time. From intricate collage works which blend natural elements with bank notes to a menagerie of glass pieces, Hall’s exhibition is the incredible melding of a strange museum and a curiosity shop all at once. The visual power of her work is all the more dynamic for the richly engaging politics running through it. © 2015 Why Look at Animals? Agrimika. Predictably, the world of economics is a major part of Maria Papadimitriou’s work, Why Look at Animals? AGRIMIKA, in the Greek Pavilion. The work is actually a shop from the centre of the country in Volos, which has been placed into a dark and derelict pavilion building, the signs of past exhibitions still evident on the wall. The shop work is dwarfed by the gallery space, creating a haunting analogy with the financial turmoil currently affecting Greece. The shop itself sells animal hides and leather, speaking to a bygone era, while the types of animals present spark allusions to the relationship between man and animal, hunter and prey. It’s a complex installation, demanding extended attention that rewards visitors generously. The Key in the Hand, 2015, (Japan Pavilion at the 56th International Art Exhibition – la Biennale di Venezia, Venice/Italy,). Of the works on show at the Giardini, it would be impossible not to acknowledge Chiharu Shiota’s mesmerising The Key in the Hand, an incredible installation which has received much attention in Japan’s Pavilion. Shiota’s exhibition is significant not only for the sheer scale and visual power of her work, but also because the loaded materials from which it is formed, keys, red yarn, boats, also carry a kind of lyrical depth that some of the more overtly political works don’t always achieve. 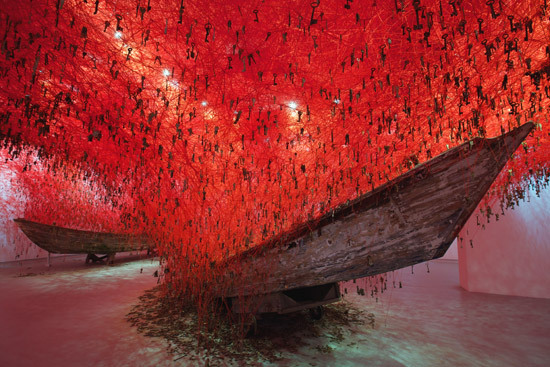 Featuring two boats, representing the hands that catch the rain of memories, the entire gallery is festooned with keys hanging from red string, a comment on security, ubiquity and also the loss of several close friends and family, as discussed in the text available near the entrance. In the curator’s exhibition in the central pavilion, it’s the selection of video work which stands out the most. Samson Kambalu’s video pieces, adhering to his ten rules of NYAU Cinema which are also inscribed on the black walls, create a compelling walkthrough in a strangely angular space within the gallery. Chris Marker’s Owls at Noon – Prelude The Hollow Men and a particularly gruesome Christian Boltanski work are also strong additions. As is always the case, the sheer size of the exhibition feels exhausting, and it’s hard not to feel that this shortcoming is evident every two years. The result is a sense of finding diamonds in the rough; a room full of Marlene Dumas’ painting here, a Hans Haacke installation there. For all the publicity about live readings of Das Kapital throughout the event, the central performance space, dubbed the Arena, felt profoundly disserted, with several exhausted looking people sprawled out on cushions in an otherwise empty room while a film played unnoticed in the background. The overwhelming scale of the work at the Giardini carries through into the International Exhibition at the Arsenale as well. Here, more video works from the likes of Steve McQueen and the late Harun Farocki sit alongside a fantastic installation by Taryn Simon, whose archival aesthetic perfectly fits in with much of the work in Venice this year. Boltanski’s video work in this exhibition is a far cry from the gore of his piece at the Giardini, a beautifully meditative piece featuring bells suspended on rods in the deserts of Chile. The Arsenale space as a whole has an altogether different dynamic, for two different but interconnected reasons. The first is that the space itself is essentially a giant ‘L’ shape, meaning that it can sometimes be unclear where the curator’s exhibition ends and where the Pavilions begin. The second is that when you do reach the Pavilions, the countries are predominantly from somewhere other than Western Europe. Whereas in the Giardini you could quite reasonably move from Germany to Britain and then on to France, or from Spain, to Belgium and then the Netherlands, in the Arsenale, you find yourself walking past Chile, Kosovo and then Tuvalu, before tackling Ireland, Latvia and the Latin American Pavilion. Significantly perhaps, many of these pavilions, from the so-called ‘periphery’ were highlights this year. The Italo-Latin American Institute (who have been responsible for the Latin American Pavilion since 1972), this year presented an incredible sound installation piece, dedicated to a collection of indigenous Latin American languages. The piece consists of a corridor flanked on both sides by speakers. When first confronted with the sound, the experience is akin to something like an airport (or perhaps a large scale international art event), a mass of different languages speaking over the top of one another. When the listener approaches each individual speaker, the sound becomes clearer and more discernible. The more engagement the audience is willing to make, the greater the effect of having only sound becomes, not only as a social commentary about the preservation of indigenous culture and language in the age of globalisation, but also as a sculptural installation in and of itself with no visual reference points. In Speculations on the Blue, created for the Republic of Kosovo, Flaka Haliti has sought to address similar topics, exploring the boarders and barriers, both real and imagined that exist in the modern world. 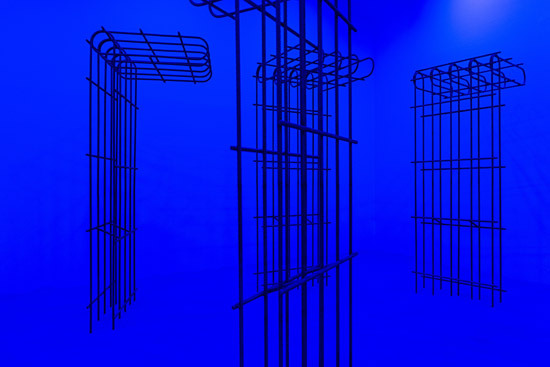 The blue colour acts as a contrast to the skeletal structures which stick out of the sand in the small, dimly lit space. 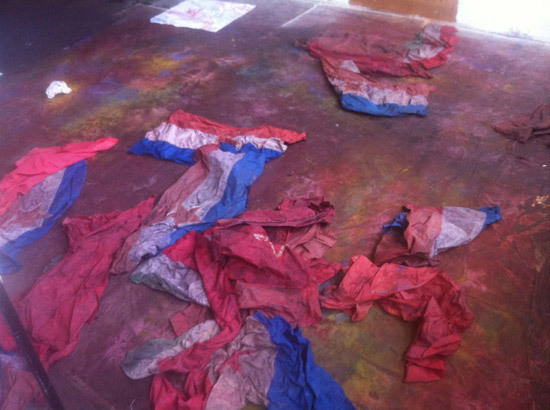 The juxtaposition of man-made impediments to movement against the wide open spaces of sky and sea suggested by the colouring casts a critical eye on the global political crisis surrounding migration, a major subject of concern in Europe at the moment. It also speaks to the history of countries like Kosovo who have had their boarders redrawn so many times in the last hundred years alone, perhaps a reminder of how in flux those notions of Statehood and place are for so many, even in Europe itself. Armando Lulaj’s exhibition, Albanian Trilogy: A Series of Devious Strategems, also examines the country’s history, and in doing so provides one of the most fascinating sculptural highlights of the whole event. 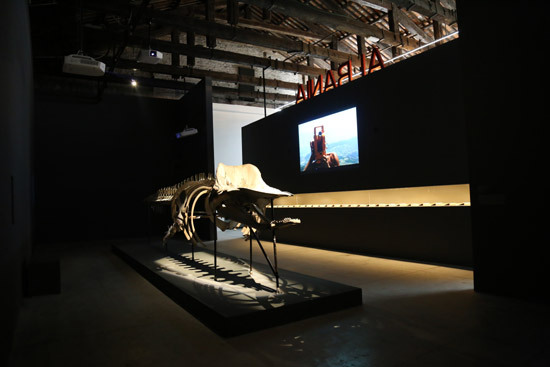 The exhibition consists of three film works, augmented by two installations which include the skeleton of a sperm whale that was shot by the military when mistaken for an aggressor during the Cold War, as Albania’s individualist communist government cycled through different positions as international leaders rose and fell in prominence. 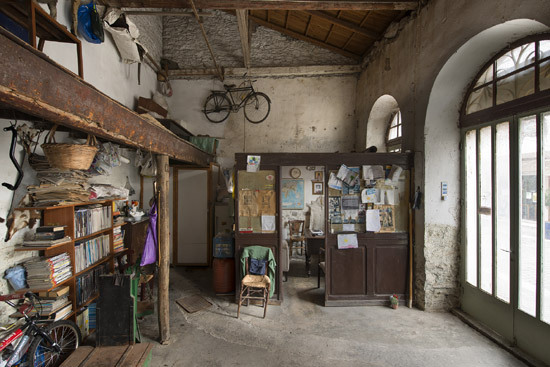 The line between fact and fiction, and the spectre of Albania’s political and social history in the modern era make it another Pavilion demanding repeat visits to get a sense of the whole body of work. Paz Errázuriz, Evelyn 1, La Manzana de Adán. Chile, 1982. Courtesy of the artist. Chile’s Pavilion, entitled Poetics of Dissent and featuring Paz Errazuriz and Potty Rosenfeld, traces stories of marginalisation and the status of the outsider in a distinctly Latin American context; that is to say, amidst the implosive forces of tradition and political upheaval. Images and videos feature patients in a mental health care facility and transvestite prostitutes amongst others, touching on gender and sexuality as well. In the exhibition catalogue, Andrea Giunta begins her essay ‘To Feel, Despite Everything,’ with the words “it may be necessary to underscore the degree to which dictatorship is a defining factor of contemporary art in Latin America,” and this stark assertion feels like a crucial hinge to exploring Errazuriz and Rosenfeld’s photographic and video installation work and texts. Some of these themes are also evident in Not Suitable for Work. A Chairman’s Tale. showing at the Estonian Pavilion outside the Arsenale in the Pallazzo Malipiero. The installation, created by Jaanus Samma, effectively turns the space into a kind of museum exhibit that traces the story of a collective farm Chairman who was found guilty of homosexual acts in 1964 and sentenced to hard labour. Later he become infamous in his new home in Tartu for living an openly gay lifestyle, before being murdered in 1990 (allegedly by a Russian soldier and male prostitute). Amongst the “exhibits” are a series of medical implements used on the chairman to assess for signs of homosexual activity when he was arrested. The pavilion also includes another standout moment in an installation entitled Loge. The piece is designed to mimic an opera box positioned up a small flight of stairs and complete with red velvet trimming, which looks out onto a completely black abyss as piano, horn and voice play. There are, of course any number of other exhibitions which one could mention in the same breath as those above (or in place of). Much of the press this year seems to be divided into two categories, those who are willing to follow Enwezor on his sometimes disjointed exploration of contemporary political struggles and globalisation, and those who find the sometimes overly theoretical, vitrine heavy work arduous and lacking the spark that some expect in a setting like Venice. It’s certainly true that some of the exhibitions feel shouted down in amongst the overwhelmingly political dialogue which many of the National Pavilions seem to speak to (Sara Lucas’ otherwise accomplished show in the British Pavilion is an example of a body of work which feels unfairly maligned for being playful and light in a otherwise sombre environment). It would be unfair however to deny the calibre of work on display simply because much of the conversation feels like it follows Enwezor’s more narrowly focussed curatorship, and in light of some of the previous year’s exhibits, a strong case could be made for this year’s event demonstrating a consistency which is not always present. Perhaps tellingly, much of the most interesting work seems to come from countries whose own political and social histories show greater trace evidence of upheaval, intervention and conflict, providing some artists an opportunity to explore darker thematic paths than are often possible in larger events such as this.